Common integration obstacles and how to overcome them. In this series we will look at common integration predicaments that can be solved using SAP Hana Cloud Platform Integration process services (aka. HCI). We will host a call (Webinar using SAP Connect) once a month and ask our community to submit their integration problems. We will evaluate the submissions over the course of the month and choose one or two that we can solve in a 35 minute demonstration. We will post the solution to a Git repository at the end of the call and the recording of the call will be made available on our site. This call is open to everyone interested in application to application process integration. If you are new to integration we suggest you first join this openSAP course for an introduction to the topic, platform and tools. You are, never the less, welcome to join our calls so you can experience a practitioner’s approach to integration and to learn from our experts. We would like you to challenge our experts with your problems by submitting them to our forum here. 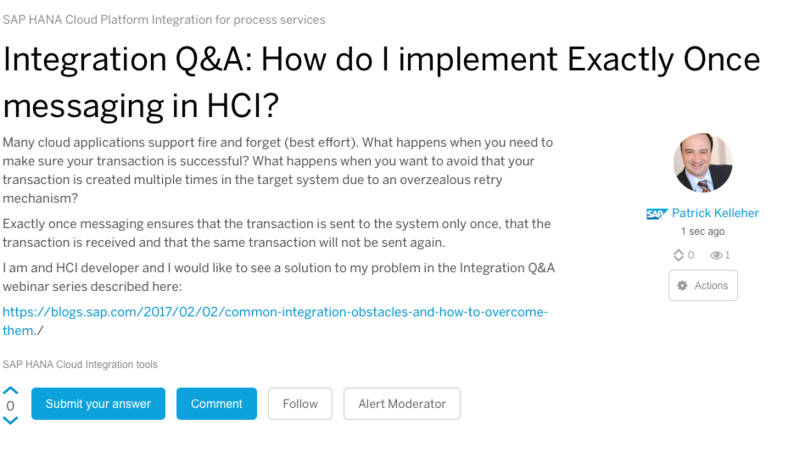 Integration Q&A: How do I implement Exactly Once messaging in HCI? Each month we will pick one or two of these challenging problems to solve and present in the monthly call. If you have already encountered a challenging problem and found a solution using HCI, we would also like to hear about it and may ask you to present your solution in one of our calls. For our first call Daniel Bianchin from the SAP Technology RIG will demonstrate how to achieve the Exactly Once Quality of Service in an iFlow. He will open with a discussion of QoS and the different use cases for the varying levels of service achievable. He will then demonstrate how to implement an iFlow that demonstrates how to send messages from a sender to a receiver in such a way as to guarantee that the message is received by the receiver system and is only received once (no duplication of messages). Our first call will take place on Wednesday, February 8, 2017 at 5pm (17:00) CET. The series will run for the next 6 months and wrap up in July, 2017. Our first user driven call will be on Wednesday March 1, 2017 at 5pm. We will maintain a schedule, with topics and recordings here. I hope you join us in this new experiment that is sure to be both fun and informative. Great idea for driving posts to forums so that we have searchable knowledge base shared by community! Thanks Patrick! Great useful information Patrick ! !